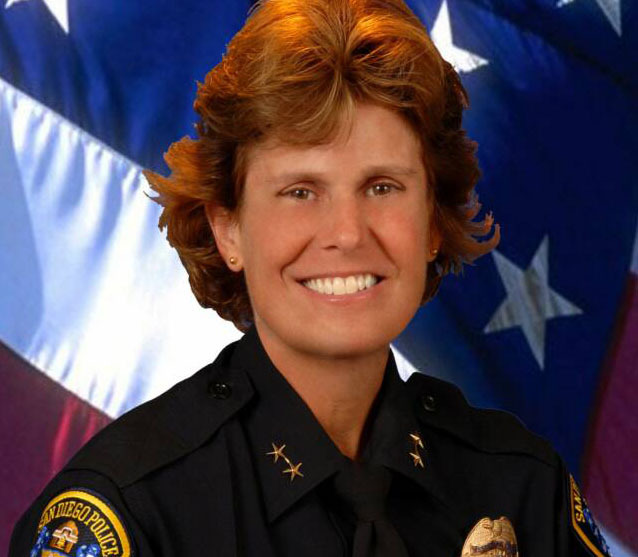 Police Chief Shelley Zimmerman was scheduled to meet Monday with members of the Southeast San Diego community who have been complaining of racial profiling and other problems with the San Diego Police Department. The so-called “Meet the Chief” town hall meeting will begin at 6 p.m. at the Jacobs Center for Neighborhood Innovation at 404 Euclid Ave.
Mayor Kevin Faulconer named Zimmerman, a 31-year department veteran, as head of the SDPD on Feb. 26, following the retirement of 10 1/2-year Chief William Lansdowne. The City Council unanimously confirmed her appointment March 4. In remarks made after assuming her new position, Zimmerman said she was grateful for the opportunity and challenge, and promised to instill a “culture of excellence” in the department. The failures of the “very few” who don’t meet the high standards will not be tolerated, Zimmerman said.